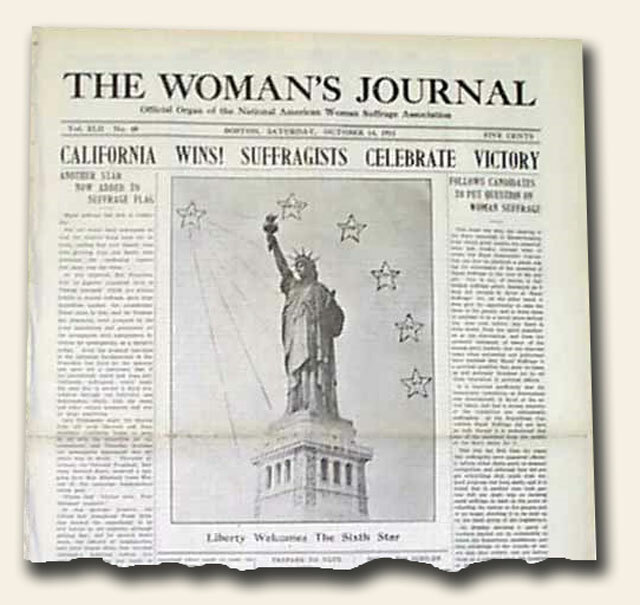 This week I traveled to The Woman’s Journal of October 14, 1911. This issue was celebrating after waiting two days for the outcome of the California election on the suffrage vote… “reading first with despair, then with growing hope and finally with jubilation the conflicting reports that came over the wires… Praise God. Victory ours. 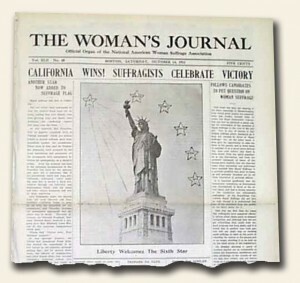 Four thousand majority.” The front page contains a photo of the Statue of Liberty with six stars surrounding her. These represented the states which have passed the “equal suffrage” — Wyoming, Colorado, Utah, Idaho, Washington and now adding California. The 1848 Seneca Falls Convention is traditionally viewed as the beginning of the Women’s Rights Movement. It was not until June 4, 1919 that Congress sent the proposal for the 19th Amendment, the woman’s right to vote, and then it was not until August 18, 1920 that the final ratification was passed, by the vote from Tennessee. It was a long road, but “we’ve come a long way baby” since then!